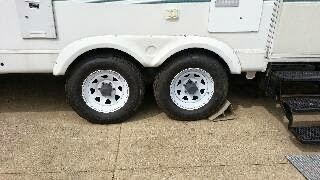 RV ADVENTURE BOUND: New 16 inch wheels & tires installed today. New 16 inch wheels & tires installed today. Very happy to have top notch Firestone tires. Should be all set for several years of travel. I actually bought them a few weeks ago but just got them installed today. Another item checked off the list. Next up.....The dually gets a new windshield. I want a nice clear picture window to look out of, during my travels. My new Empire heater arrived today. First trial of the new heater. Laying out the truck bed.